Earn up to 24,000 reward points. A veritable cannon of a guitar, with a resonant solid spruce top and cool electronics. 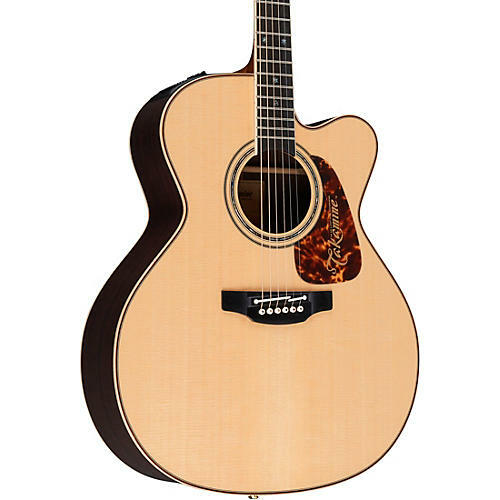 Takamine's powerful P7JC jumbo cutaway model is a veritable cannon of a guitar, with a resonant solid spruce top with scalloped "X" top bracing and solid rosewood back and sides for great clarity and forceful projection, a convenient Venetian cutaway for easy access to the upper reaches of the fingerboard, and elegant maple body binding with dark wood purfling and abalone rosette. Built with the performer in mind, the P7JC features Takamine's proprietary CTP-2 Cool Tube preamp system paired with the unique Palathetic under-saddle pickup for peerless amplified response. The dual-channel CTP-2 provides low-voltage tube tone, variable from bright and brilliant to thick and warm, three-band EQ with semi-parametric midrange, auxiliary input and volume (for use when a second pickup is added), and an onboard chromatic tuner. Other performance-enhancing features include Takamine's asymmetrical neck profile - which is slightly thinner on the treble side so that it fits the natural shape of your hand, resulting in a comfortable feel and improved playability. The split bone saddle provides more accurate intonation, and the rosewood bridge features abalone-dot ivory pins. Premium design appointments include an ebony fingerboard with ivory binding, abalone "snowflake" inlays, a dark rosewood headcap with abalone Takamine logo, gold tuners with gold buttons, a natural bone nut and smooth gloss natural finish. The P7JC comes complete with premium archtop hardshell case. After over two years of research and design time, Takamine has once again demonstrated their leadership in acoustic-electric guitar amplification technology. The Cool Tube preamp introduced at the January 2004 NAMM show in Anaheim, California is the most significant development in "on-board" acoustic signal processing since Takamine presented the Acoustic DSP, the industry's first on-board "digital" acoustic guitar preamplifier in 1998. The Takamine Cool Tube preamp is an on-board acoustic- electric preamp that utilizes a 12AU7 dual triode vacuum tube. The "Cool Tube" packs a huge amount of features and amazing tone into a compact package that fits neatly into Takamine's "SoundChoice" docking port. The "Cool Tube" preamp joins a range of five distinctly different preamps that are all interchangeable, giving the Takamine player several great options to fit their personal style and taste. See why everybody's talking about Takamine. Order today.